You are updating the application to resolve the issues. You plan to create a new database on SQL1 to support the application. 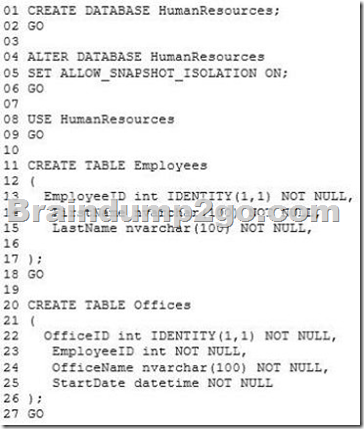 The script that you plan to use to create the tables for the new database is shown in Tables.sql. The script that you plan to use to create the stored procedures for the new database is shown in StoredProcedures.sql. The script that you plan to use to create the indexes for the new database is shown in Indexes.sql. A stored procedure named usp_UpdateEmployeeName will be executed only by other stored procedures. The stored procedures executing usp_UpdateEmp!oyeeName will always handle transactions. 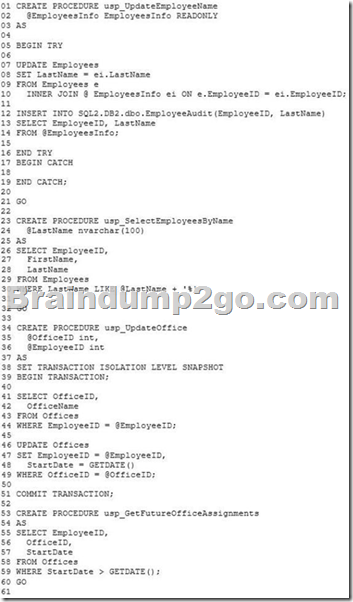 /* Create a procedure to receive data for the table-valued parameter.